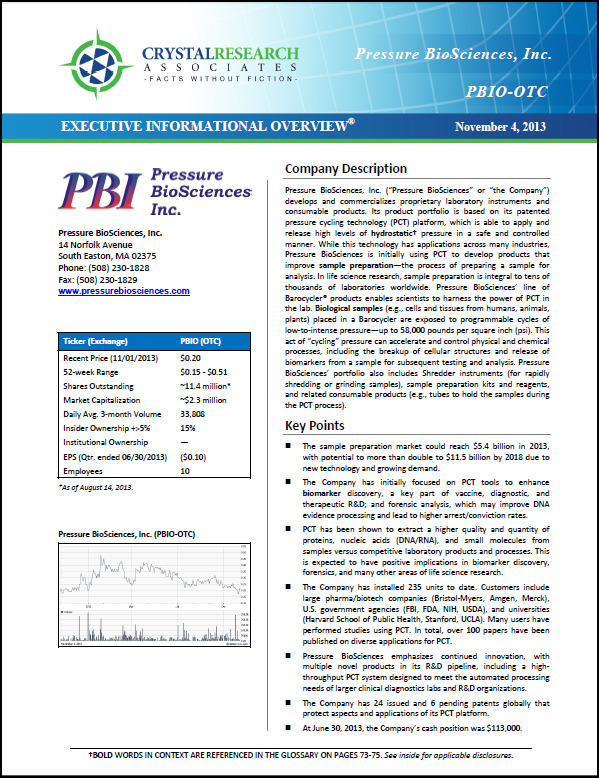 Pressure BioSciences, Inc. (“Pressure BioSciences” or “the Company”) develops and commercializes proprietary laboratory instruments and consumable products. Its product portfolio is based on its patented pressure cycling technology (PCT) platform, which is able to apply and release low to high levels of hydrostatic pressure in a safe and controlled manner. While this technology has applications across many industries, Pressure BioSciences is initially using PCT to develop products that improve sample preparation—the crucial process of preparing a sample for analysis. In life science research, sample preparation is integral to tens of thousands of laboratories worldwide. 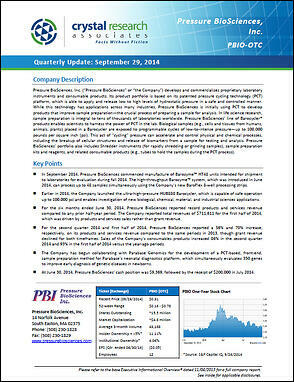 Pressure BioSciences’ line of Barocycler® products enables scientists to harness the power of PCT in the lab. Biological samples (e.g., cells and tissues from humans, animals, plants) placed in a Barocycler are exposed to programmable cycles of low-to-intense pressure—up to 100,000 pounds per square inch (psi). This act of “cycling” pressure can accelerate and control physical and chemical processes, including the breakup of cellular structures and release of biomarkers from a sample for testing and analysis. Pressure BioSciences’ portfolio also includes Shredder instruments (for rapidly shredding or grinding samples), sample preparation kits and reagents, and related consumable products (e.g., tubes to hold the samples during the PCT process). 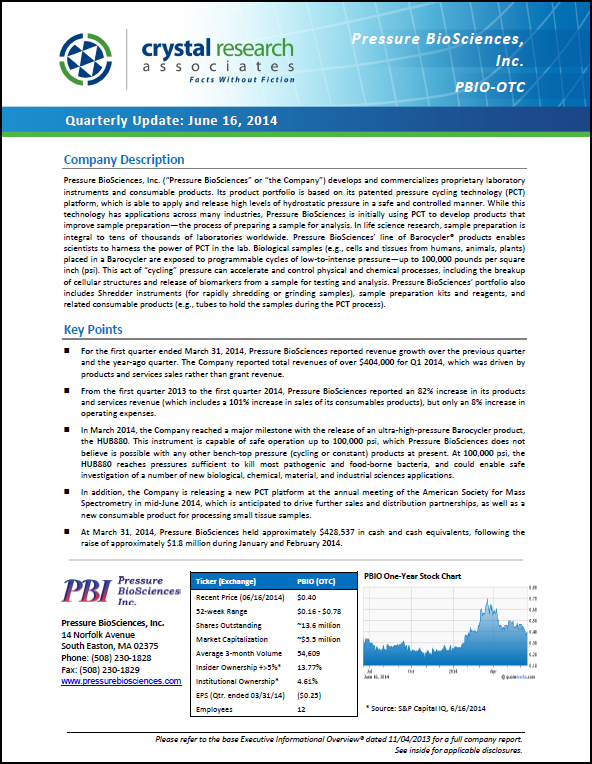 * The Corporate Snapshot was last updated on September 29, 2014.